This article is an attempt to present the history of the geographical region of Macedonia in more trustworthy and more impartial way on the base of authentical documentary material. From historical point of view Bulgarian ethnical presence in Macedonia is as old as it is in all the other Bulgarian regions, most of which like Macedonia are not within the boundaries of today's Bulgarian state. So it s not without reason to ask why today's Bulgaria includes the smallest Northeastern part of Macedonia. Is this a consequence of the political mistakes only done during the past twentieth century or is it a result of an all-round policy started by the Bulgarian statesmen as far back as Middle Ages? Where actually was the strongest Bulgarian ethnical presence in Macedonia and did it coincide with the Bulgarian state-political presence there during the Middle Ages? Why, however, Macedonia was and still is an apple of discord for all Balkan nations (Bulgarian, Serbian, Greek, Albanian, Turkish and Rumanian)? In order to give more objective and well-grounded reply to all these questions we have to remember some basic moments of Macedonian ancient history. By the beginning of the 6th century BC the ancient Hellenistic (Hellenic like, Greek like) state of Macedonia took shape on the territory of today's geographical region. Ethnically the ancient Macedonians were related to the ancient Greeks, Thracians and Illyrians. Their state gained strength under the rule of King Philip II (359-336 BC), who created the famous Macedonian phalanx which helped him to conquer most of Greece and Thrace. His son Alexander III the Great (336-323 BC) made of Macedonia one of the earliest large empires in human's history. He took hold of all the Near East and part of the Middle East as far as India. After his death however this empire and even the old Macedonian kingdom fell apart into separate Hellenistic states led by Alexander's commanders, descended from distinguished aristocratic families. They started long and bloody civil wars, which weakened even more the ancient Macedonian state. In addition, most of the native Macedonian population gradually moved east and their lands were occupied mainly by Greek mercenaries, Hellenized Thracians and Illyrians, as well as Celts. This fact quickened the processes of Hellenization. On the other hand, the weakening Macedonian state because of its strategic situation gradually became one of the first targets of rising Rome. In 168 BC, after three heavy wars, the Romans finally conquered Macedonia and divided it into four separate parts. In other words Macedonia became one of the first Balkan countries, conquered by Rome and thus one of the first regions on the peninsula submitted to the processes of Romanization. Roman authority led purposeful policy in this respect conducting constant administrative changes and moving great masses of Italian and Anatolian population. But the ethnical aspect of the Balkans started changing radically in the middle of the third century AD when the peninsula was exposed to barbarian invasions. These affected Macedonia as well. It can be firmly stated that as early as the fourth century AD the native population of the region was to a great extent replaced by compact masses of Goths. Probably part of them were Byzantinized within the frame of the East Roman Empire in the 5th century, while the rest of them moved to Italy, Gaul and Spain by the end of the same century. Anyway at the end of Antiquity the old Macedonian ethnic body did not exist anymore - on the territory of Macedonia lived actually some half-barbarous half-Romanized half-Hellenized population, who in order to have more citizen and economic rights strove to define themselves as Romans. The biggest ethnical changes were still to come. In fact as early as the 5th century the Bulgars as part of Attila's semi-nomadic empire of the Hunns (later on their own) repeatedly crossed the Macedonian land during their raids against the East Roman empire or as its allies. An interesting fact is that according to written sources Bulgarian first more significant penetration in Macedonia took place earlier than that of the Slavs' - as early as the last days of the rule of Emperor Anastasius I, probably in 517, while the Slavs appeared in those lands in the time when on the throne was his successor - Emperor Justin I (518-527). Notably strong was their pressure during the rule of Justinian I (527-565), when they were in action together with and often under the leadership of the Bulgars. In the second half of the 6th century the Bulgars and Slavs were subject to the Avars, but the barbarian pressure against the empire increased still more. In 586 Avars, Bulgars and Slavs laid the first serious siege to the main Macedonian town Thessalonica and this was the beginning of their age-long ambition to conquer it. In 597 there was another siege. Its failure proved that the invaders' attempts were to be fruitless unless they could keep under control the surrounding area. In 610 Avars, Bulgars and Slavs launched a mass offensive against Byzantium, which swept the Danubian frontier, destroyed and deVastated important and big fortified towns and laid the beginnings of mass Slavic settlement mostly in Moesia, Dacia and Macedonia. In 615 and 617 they laid two more threatening sieges to Thessalonica and this time the attackers were part of the population located in the vicinity of the city. The Greek sources give us the names of the following Slav tribes on the territory of Macedonia: "Drougouvitai, Sagoudatoi, Berzitoi, Ryghinoi". The ethnical aspect of the region was so radically changed that the name of Macedonia, used to mark the region before disappeared from the evidence for several centuries and another term appeared instead - "Sclavinias". It was only by 675 that the Emperor Constance II managed to find power, ways and means and try to subdue i.e. to put the Sclavinias under tax and political obligation. Due mainly to the lack of co-ordination and low extent of organisation the Slavs in Macedonia were subjected without great efforts though there were some attempts for resistance like that of the Slavic leader Perbound in 675 and two years after his murder the Slavs tried once more to attack Thessalonica. And right then when it seemed that the empire regained its hold on Macedonia on the political stage there appeared new opponent - more organised, more powerful and for that reason more dangerous - the Bulgars led by Kouber, who tried like their kinsmen subject to Asparoukh to lay the beginnings of another Bulgar state which probably was to be centred round Thessalonica itself. Their attack against the main Macedonian city in about 682-684 failed too but it was much more far-reaching in consequences both political and ethnical for the whole of Macedonia. First of all it is clear from the evidence that the Byzantine Emperor Constantine IV accepted the existence of another big Bulgar group in Macedonia officially within the boundaries of the Empire but actually under the rule of their own leader Kouber. And what is more he asked the Bulgars to be supplied by the Slav tribe called Drougouvits and that was exactly what was ordered from Constantinople, The Drougouvits themselves neither refused nor protested against this decision. To put it another way the Byzantine emperor acquiesced to concede to the Bulgar chief the right to rule over part of the local Slavs in Macedonia. That was the first success of the Bulgar policy in this respect achieved as far back as the end of 7th century! Constantinople kept on recognizing the Bulgars' special rights in Macedonia even after Kouber's abortive action against Thessalonica which by all means should have been treated by the Empire as disloyalty and rebellion. At that time the Bulgars in Macedonia were called "Sermesianoi" after the name of the region they had come from - Sirmium/Srem (today's Sremska Mitrovica in Serbia). In the long run despite the reverses of fortune it was Kouber's Bulgars that became that oldest Bulgarian main body in Macedonia which laid the beginnings of the Bulgarian national spirit there and determined the long lasted ambition of the Danubian Bulgars to unite all Bulgarians on the Balkan peninsula under one rule. In fact the Byzantines themselves seemed to finally become reconciled with the loss of their old province Macedonia - at the end of the 7th century they established a new administrative district -theme, called again Macedonia but the new one had nothing to do with the ancient province as it included parts of Thrace and the Rodopes while its centre was Adrianople / Odrin (now Edirne). Thus during the following centuries the name „Macedonia" acquired completely different ethnic-political and geographic meaning. At that time it was already obvious that Kouber's Bulgars would not be able to lay the beginnings of another Bulgar state in Macedonia. That was the reason why their kinsmen round the banks of the Danube started to pursue more active policy aimed at incorporating them into already consolidated Danubian Bulgaria. The first action in that respect dates back to the reign of Khan Telerig about 774. Some nowadays historians in Skopje define this action as „the beginning of the Bulgarian aggression against the Macedonian Slavs". But the analysis of the Byzantine sources shows that even if there was some „Bulgarian aggression" it was not levelled against the local Slavs but against the Byzantine administration in Macedonia. In fact the Bulgarian military and political penetration in Macedonia began during the reign of Khan Kardam. In 789 one Bulgarian troop penetrated in Struma valley and defeated the main Byzantine camp, which was the first military success worth mentioning. The first more serious success though took place at the beginning of the 9th century during the reign of Khan Krum. In 808 his armies penetrated again up the Struma valley and next year it was not by chance that he took hold of Serdica (now Sofia), which enabled him to control Northeastern Macedonia. Probably this attack took place in 812-814 and it gave Khan Krum the chance to recruit auxiliary troops from „all Sclavinias too", i.e. from among the Slavs in Macedonia. His heir Khan Omourtag was probably forced to give part of the newly conquered territories back to Byzantium, but in 837 a Bulgarian army led by Kapkhan Isboul won important victories at Serres and Philipi thus gaining the control over the Western Rodopes and Eastern Macedonia. This was fundamental as it enabled the expansion of the Bulgarian authority towards the central and western Macedonia and the inclusion of the regions along the valleys of Vardar, Drin-Cerna and the Lake of Prespa (the areas around Stip, Skopje, Prilep, Ohrid, Bitola). This process was already finished by the Khan Boris' ascension to the Bulgarian throne in 852. It was during his reign that the territory of the Bulgarian Macedonia was divided into at least three administrative regions - comitats: Bregalnica centred around Skopje, Kutmicevica centred around Devol, later around Ohrid and finally the south-eastern part with its centre Strumica. It was in Kutmicevica that in 886 Boris I sent one of the most distinguished disciples of Cyril and Methodius - St Clement of Ochrid. His main task there was to create Bulgarian clergy capable of performing the liturgy in Slavic old-Bulgarian language or as it is known Slavonic liturgy. His best disciples formed an entourage of learned men who constituted the so called „Ochrid's Educational Center". 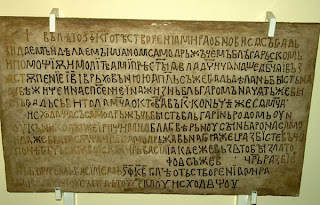 It was there, under the guidance of St Clement and on the orders of Tsar Symeon I at the beginning of the 10th century where a spelling reform was carried out the sense of which was to replace the unintelligible Glagolic alphabet with the so called Cyrillic (actually „Clementic") alphabet. Most of Macedonia still remained within the boundaries of the First Bulgarian Kingdom during the reign of Symeon's heir Tsar Peter I (927-969). And as an inseparable part of Bulgaria the region shared both its successes and failures, lived in peace and suffered with it the consequences of invasions. In 971 most of the northern Bulgarian territories were conquered by Byzantium and the centre of the Bulgarian state-political life started to move to the south-west of the Balkans where the sons of Nicholas, the Count of Sredec (old Serdica - now Sofia) took hold of the power. Unfortunately this fact is used as grounds for one of the greatest speculations with the history of Medieval Bulgaria. Most of the historians in Skopje announce this fact as the beginning of some „Macedonian Medieval Kingdom". Entering into details is unnecessary as it is quite enough to mention only several things which show that this speculation is absolutely groundless: until 986 Count Nicholas' sons (Cometopuli) ruled the independant Bulgarian territories in Macedonia and out of it (the regions of Vidin, Branicevo, Belgrade, Nis and Sofia) from Sredec / Sofia which is probably their place of birth. They gave there shelter to the Bulgarian Patriarch. When Tsar Boris II was murdered they welcomed his brother Roman. Roman was castrated so he was not able to be a ruler but nevertheless he was recognized as the legal heir of the throne. Later Roman established his residence in Skopje. Only after his death did Samuel seem to declare himself a Tsar. Later his nephew John Vladislav stated this clearly in the Inscription of Bitola (kept hidden even today) from 1016 where he is defined himself as "native Bulgarian" and „Bulgarian autocrat". And later on, in 1018, when the Byzantine Emperor Basil II broke down the last efforts of Samuel's successors to resist he called himself „Boulgaroktonos" (Killer of Bulgars) and not „Makedonoktonos" and this is hardly by chance. Basil II divided the conquered lands into several parts. The largest of them included today's Vardar Macedonia it was centred around Skopje and was called by the Byzantines themselves „Thema Boulgaria". In early Medieval period Bulgarian ethnical and state-political presence is clearly evidenced but later its character became more dramatic and tragic. The Byzantine rule intensified the processes of Hellenization but it could not eliminate the Bulgarian ethnic character of Macedonia and especially of its central, northern and eastern parts. However the Greek ethnic element considerably strengthened its presence in Southern Macedonia. This fact was first of all felt at the end of the 12 th and the beginning of the 13 th century when the Asen brothers started recovering the system of Bulgarian state in Macedonia. In 1191 the Bulgarians reached for the first time the valley of Upper Struma but could not go farther than Rila Monastery. At the same time the Serbs led by Stefan Nemanja conquered Skopje for the first time and devastated the town and that was an emblematic sign showing the appearence of a third power which was yet to begin challenging the rule over Macedonia. In fact Dobromir Chrysos three times backed out of his alliance with the Byzantine emperor under the influence of Tsar Kalojan who acted with great political wisdom turning his back to the desire for personal revenge. At the end of 1202 the Byzantines managed to get rid of Dobromir Chrysos and conquered the Struma region but they could not hold it even for a year. When the crusaders from the Fourth Crusade came to the walls of Constantinople Alexius III hid himself in Debeltos asking desperately Tsar Kalojan for help. But the Bulgarian ruler knew better than that and instead of helping the fugitive in summer 1203 he started conquering Macedonia. He took Skopje, Prizren and Ohrid and appointed a Cuman chief called Cuzmen (Etzuismenos) as a governor of Struma region. When the crusaders captured Constantinople their leaders started parcelling out the lands of Byzantium. 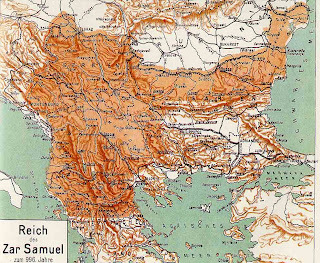 The territory of Macedonia was included within the boundaries of the so called Kingdom of Thessalonica given to marquis Boniface of Montferrat. The result of this and of the consequent military actions was that Thessalonica, Serres and Veria, i.e. the southern and southwestern parts of Macedonia were taken by the Latins, its western parts remained under the rule of the Despotate of Epirus while its northern and northeastern parts remained under the rule of the Second Bulgarian Kingdom. Thus however Macedonia was for the first time divided among more than two political powers. All this made Tsar Kalojan during the last two years of his reign (1205-1207) constantly trim and wage wars now against the Latins now against the Greeks. Thanks to his extremely clever diplomacy and military tactics this great Bulgarian ruler managed to gain the rule of almost all Macedonian region as it was during the reign of Symeon and as it was later under the rule of Samuel, only that Kalojan could not take Thessalonica. It was under the besieged walls of Thessalonica in September-October 1207 that Kalojan was murdered as a result of a Greek plot. The death of this remarkable statesman soon led Bulgaria to turmoils which had negative effect on the Bulgarian state-political presence in Macedonia. The right of the new Tsar Boril to rule the country was challenged by his brother Strez who declaired himself an independent ruler of Vardar Macedonia and by Boril's cousin Alexius Slav who took hold of the Rhodopes and Pirin Macedonia. The worst of all was that following their reckless desire to defy Boril they placed themselves at the service of hostile powers who strove to take as much of Macedonia as possible - Strez asked the Serbian king for help while Alexius Slav acknowledged himself a vassal of the Latins and later he became related to Theodore of Epirus, proclaimed as "Emperor of the Romans" - de facto King of Thessalonica. Gradually by 1224 most of Macedonia was included within the boundaries of Theodore's state only the region of Melnik still belonged to Alexius Slav but he was more a friend of Theodore than of his relative - the new Bulgarian Tsar John II Asen (1218-1241). 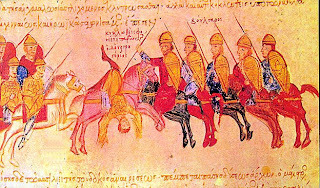 It was not until the Battle of Klokotnica on 9 March 1230 that the Bulgarians regained their control over most of Macedonia with the exception of the region of Thessalonica which was ruled by Manuel Angelus Comnenus - Theodore's brother but Tsar John II Asen's son-in-law and vassal. After the death of John II Asen in 1241 the power of Bulgaria weakened as a whole so did its influence in Macedonia. As early as the next year Nicea which again set foot on the Balkans mainly thanks to the help of Bulgaria started systematically taking hold of the region of Thessalonica. Especially grave were the consequences of the coup d'etat in Turnovo in 1246 when the rule was taken by the “pro-Nicean” group around John II Asen's second wife Irene Comnenos and her son Michael II Asen. Shortly after that John III, the emperor of Nicea, took at first the regions of Serres and Melnik, then the regions of Struma, Bitola, Skopje and even Velbuzd and all this without any resistance or reaction on the part of Bulgaria. Thus the Bulgarian rule in Macedonia was completely destroyed and the region was divided between Nicea and Epirus. In 1254 emperor John III managed to drive the Epirotes out of Voden, Kastoria, Devol, Prilep, Veles and Ohrid. It was not until his death that the Bulgarians in Macedonia rebelled against the Niceans and tried to restore the rule of the Bulgarian state in the region. But the rebellion led mainly by Dragota, the chief of Melnik, failed and this was the last serious attempt to bring Macedonia back within the boundaries of medieval Bulgaria. From that moment on the Bulgarian medieval state was no longer to decide or influence the fate of its population in Macedonia with one only exception. In fact after 1255 the Byzantine power in Macedonia considerably strengthened and it was not the Bulgarians who resisted it but the Serbs whose presence here became increasingly sensible. It is no chance that the evidence defined the Bulgarian Tsar Constantine Tih who ascended to the throne in Turnovo supported by the Greeks as a half-Serb descended from Skopje. Even the Inscription of Bojana Church lays particular stress on the Serbian origin of Sebastocrator Kalojan „ the Tsar's cousin". In fact the Serbs made their first attempts for military invasion in Macedonia shortly after the Bulgarian abortive rebellion. 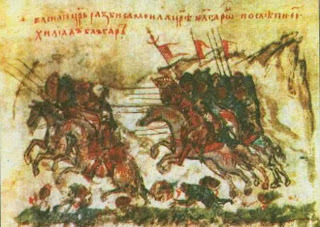 In 1257 a Serbian troop passed through the region of Skopje and Kicevo then it laid seige to Prilep as allies of the Epirotes. By the beginning of the 1280's the restored Byzantine empire was still holding the whole region of Macedonia under its rule. But when the energetic King Milutin (1282-1321) ascended to the Serbian throne things went wrong for the Byzantines. In two years' time after an extremely agressive campaign the Serbians took Skopje and all the Northern Macedonia up to the line Strumica - Prilep - Ohrid which became the new boundary between Serbia and Byzantium. The Bulgarian state under the rule of the Tsars George I Terter and Smilec as the Byzantine writer Pachymeres put it „was not able to help itself let alone help someone else". In fact the marriage between Milutin and the Bulgarian princess Anna Terter seems to show that the Bulgarians acquiesced the Serbian agression in Macedonia. And Milutin kept on expanding his territory - in 1297 he took Western Macedonia and part of the Albanian coast. The only reponse to this action on the side of Tsar Smilec's widow was to make a futile and humiliating attempt to offer her own self as Milutin's new wife. But the Serbian king decided to stake on the more favourable (though scandalous) marriage with the six years old Byzantine princess Simonida Palaeologos. Thus the traditional Serbian-Byzantine alliance attained not only its usual anti-Bulgarian political purpose but from now on it was based on territorial-political deal between the two countries at the expense of the Bulgarian population in Macedonia. An attempt to shatter this statusquo pernicious for the Bulgarians made Tsar Theodore Svetoslav. In 1304 he waged a war against Byzantium after he had made an alliance with the Catalanian mercenaries in Thrace who later crossed into Macedonia. But the Byzantines foresaw the great danger and managed to keep the situation in Macedonia unchanged by making important concession in Thrace. From the beginning of 1320's on important political changes took place in all the Balkan countries: in Byzantium one of the heaviest civil wars began - the war between the two emperors both called Andronicus - a grandfather and his grandson started fighting for the throne; in Serbia too a civil war began after Milutin's death - his sons faught for the throne, but it was quite easily taken by Stefan Decanski; in Bulgaria after the tragic doom of George II Terter the dynasty changed again, but the rule was once again stabilized when in 1323 the Despot of Vidin Michael III Sisman Asen ascended to the throne in Turnovo. Gradually Serbia and Bulgaria took a different and contrary stand in relation to the civil war in Byzantium - this time it seems the Bulgarians took the side of the successful younger claimant Andronicus III while the Serbs sided with old Andronicus II. But the Bugarian Tsar did not gain much though he had chosen the winning side. That's why he decided to take the extraordinary opportunity of turning the Serbs out of Macedonia with the help of Byzantium. But the new emperor was only urging Bulgarians and Serbs against each other waiting to see what would happen. The Serbs themselves were feverishly looking for allies and mercenaries while the Bulgarian Tsar was overboldly carrying out military demonstrations between Vidin and Sofia contented with some insignificant help rendered by Vlachs and Tatars paying no attention to the possibility to win over such an outright and powerful Serbian enemy as the Hungarian king Charles Robert of Anjou. That was the reason why the clash between the Serbs and the Bulgarians on 28 July 1330 near Velbuzd was such a disaster for Bulgaria and its ruler who met his death in that battle. The worst was the effect on the Bulgarian policy towards Macedonia - it completely disappeared while Bulgaria itself sank to the level of an inferior political factor on the Balkans gradually overshadowed by Serbia. When Emperor Andronicus III died in 1341 the Serbian ruler decided that the treaties were inoperative and he could continue his expansion in Macedonia. Taking advantage from the new civil war in Byzantium the Serbs advanced to the south and in 1342 they conquered Voden (Edessa) and Lerin (Fiorina), in 1344 - the stronghold of Veria, in 1345 - Serres and all the Eastern Macedonia. As a matter of fact the Serbian ruler did not questioned the Bulgarian character of the newly conquered lands as his new official signature proves: "Stefan, by the Christi God true King of all Serbian and maritime provinces and of the Greek and Bulgarian confines". Soon after that his self-confidence obviously grew so much that on 16th April 1346 he declared himself „Tsar of all Serbs and Greeks" and in the old Bulgarian capital of Skopje he was given the Tsar's crown and not only by the Archbishop of Serbia but also by the Patriarch of Turnovo and there were other Bulgarian bishops there to give him their blessing while in the same time the Bulgarians disappeared from his title obviously quite tendentiously! Soon after the coronation the Serbian tsar divided the newly Conquered lands in Macedonia just like a real emperor among his entourage - the largest parts were given to John Oliver in the region of Ovcepolje and the brothers Mladenovic in the regions of Ohrid and Velbuzd-Kumanovo. It was not until 1350 that the Emperor John VI Cantacuzenus decided to drive the Serbs out of Southern Macedonia at least using the help of the Turks - the success was short-lived and the mostly Bulgarian local population was brought to ruin by the Turkish mercenaries. Soon after that fatal events were to change the fate of all the Balkans - in 1354 the Ottoman Turks firmly set foot on the European continent having conquered the strategic stronghold of Gallipoli; soon after that John Cantacuzenus was driven to abdicate, a year later the Stefan Dusan died - and those seemed to be the first signs of the forthcoming calamity of the Balkan Christianity and the expansion of the Islam. In the same time the death of the powerful Serbian ruler led to the disintegration of his empire which affected first of all Macedonia. Dusan's widow - the ex-Bulgarian princess Helen established herself in the region of Serres ruling it on the behalf of her son - the imbecile Tsar Stefan Uros; Southern Macedonia was ruled by Dusan's half-brother Symeon Uros Palaeologus (Sinisa) later it was taken by Radoslav Hlapen; in Vardar Macedonia the brothers Vukasin and Ugljesa Mrnjavcevic gained a footing, while in the regions of Struma and Velbuzd Despot Dejan's sons John and Constantine firmly established themselves. Thus Macedonia was divided into several Serbian principalities and the Byzantine power was established in the region of Thessalonica and some southeastern and southern parts. In 1360's the brothers Vukasin and Ugljesa proved to be the strongest - the first one declared himself a king in Skopje while the second one went to Queen Helen in Serres where he was honoured with the title of despot. In fact a Serbian chronicle from the 15th century is quite indicative describing how the king of Serbia „gave the two brothers to rule the Bulgarian kingdom". One of the earliest Albanian chronicles defines Vukasin as a „king of Bulgaria". Gradually the two brothers were involved in the next Serbian civil war and at the face of the ever growing Turkish threat at that. It was not until 1371 that they decided quite overboldly to stop the Turks to Marica river but they suffered an utter defeat at Cernomen (today's Ormenion). Their defeat did not bring the Turks in Macedonia right away as it has been stated but it caused great changes which prepared the ground for this there. In fact the Byzantines gained most of all at first driving the Serbs out of Southern and Eastern Macedonia. The Serbs had great losses not only in the principality of Serres hut also in „Vukasin's kingdom" - Vukasin's successor King Markov spite of his great claims and immense popularity" lost everything except the lands around Prilep and Debar and at the end died in 1395 serving as a Turkish vassal and ally against the Hungarians and Vlachs. At the same time the Albanians appeared in Macedonia and two Albanian clans - Gropa and Muzachi - conquered Ohrid and Kastoria. Among the Serbian principalities in Macedonia the brothers Dejanovic (Dragas) gained most of all after the disastrous Cernomen battle. They were the first to aknowledge themselves as Turkish vassals (in 1372) and expanded their territories towards Strumica, Petric, Melnik, Ovcepolje, Stip, Radovis, Tikves as far south as Dojran, they also took Velbuzd and Vranje. Just like King Marko the youngest of the Dragases - Constantine remained a loyal ally of the Turks right to the end of his life in 1395. The Turks called their friend, the Serbian despot of Velbuzd, Kyostendil and paradoxical as it may seem this name is still used today to indicate the town that grew in the place of the medieval Bulgarian town of Velbuzd. The invaders managed not only to make the Serbian and the Byzantine rulers Turkish vassals but as early as 1380's they also managed to conquer some of the most important strongholds in Southern Macedonia. On 19th September 1383 Serres was taken and Thessalonica was besieged when its ruler Manuel II Palaeologus declined his vassal dependence. In summer 1385 the Turks captured Stip, Veles, Prilep and Bitola and soon after that Veria and Kastoria. After the Battle of Kosovo in 1389 the pressure against Skopje increased and at the end of 1391 - the beginning of 1392 the Turks managed to take the town. They immediately settled there a great number of Ottoman Turks. Thus Skopje became the first big Muslim centre in the Western Balkans (Turkish name Uskub) - a springboard for the Turkish expansion to the north and northwest. The fate of Thessalonica and its region in the end of the 14th and the beginning of the 15th century was slightly different from the fate of the other parts of Macedonia. The main town of Macedonia region was captured for the first time by the Turks in 1387 after four years of siege. The local government however as in many other places was left in the hands of the local Christian population though it was not spared the horrible blood duty called „devsirme" thanks to which was recrouted the famous corps of Janissaries. That's why when the inhabitants of Thessalonica heard of the great defeat Bayezid I suffered near Ankara in 1402 against the Tatars led by Timur (Tamerlane) they rebelled and gained their freedom. Soon after that the first Bayezid's successor Suleyman I consented officially to give Thessalonica back to Byzantium if the empire helped him win against his brothers. Later the land was divided between the members of the emperor's family and Thessalonica was given under the rule of the co-Emperor John VII Palaeologus - son of Andronicus IV and the Bulgarian princess Kera Tamara, John Alexander's daughter. After John's death in 1408, the Emperor Manuel II Palaeologus gave Thessalonica under the rule of his son Despot Andronicus who was ailing and weakling and could do nothing to strenghten the main city in Macedonia - second of importance in all the empire. In 1422 the new Turkish sultan Murad II laid a long and heavy siege to Thessalonica which at the end left its inhabitants without any hope for salvation. Next summer Despot Andronicus and the municipality of Thessalonica decided to commit the government of the town to the Venitians hoping that they Would help against the merciless foes. But the Venitians too acted inconsistently and hesitatingly - they could neither defense the town effectively nor rule it properly and gradually they antagonized the inhabitants of Thessalonica. On 26 March 1430 the sultan's troops who had laid a passive siege till now started a direct assault against the town to capture it. Three days later Thessalonica was taken by the Turks and thus the whole Macedonia was conquered. LEARN TO KNOW, ALL OF YOU FYROMIAN IDIOT STEALERS, THE ONLY ONE TRUTH ABOUT MACEDONIA. MACEDONIA IS ONE AND ONLY, MACEDONIA IS GREECE! There is no doupt that ancient Macedonians were Greek. It is thoroughly proved by historic documents and archaeological discoveries which can be found in history books and museums in Greece and arround the world. The most important archeological discovery in Macedonia is the tomb of King Philippos II. It was excavated in Vergina, Greece in 1978 and it proves beyond any doubt the Greekness of ancient Macedonia. All the findings are characteristic of the Greek culture and all the inscriptions are written using the Greek language. Among the discoveries of this tomb is the "Vergina sun" the symbol that FYROM attempted to use on its flag initially. All the monuments and inscriptions found in the Macedonia are written using the Greek language. Take a look at the archaeological discoveries. There is no historic evidence to suggest that the Macedonians were using a different language. All the ancient Macedonian names mentioned in history or found on tombs are Greek. All the kings of Ancient Macedonia had Greek names. Nobody discovered ancient Macedonian names ending to -ov or -ovski or whatever. Alexander's name is Greek. The word "Alexandros" is produced from the prefix alex(=protector) and the word andros(=man) meaning "he who protects men". The prefix "alex" can be found in many Greek words today (alexiptoto=parachute, alexisfairo=bulletproof - all these words have the meaning of protetion). Philip's name is also Greek. It is produced from the prefix Philo(=friendly to something) and the word ippos(=horse) meaning the man who is friendly to horses. The prefix "philo" and the word "ippos" are also found in many words of Greek origin today (philosophy,philology, hippodrome,hippocampus). A detailed list of ancient Macedonian names can be found here. • The regions of ancient Macedonia had Greek names. The regions which formed ancient Macedonia had Greek names. Most of these names are used in Greece even today. You can see a list of the regions of ancient Macedonia here. • Macedonian architecture was similar to the Greek architecture. All the buldings found in the Macedonia region have many common characteristics with the ones found in the rest of Greece. Palaces, temples, theaters markets are characteristic sampes of ancient Greek architecture. • Macedonians fought together with the rest of the Greeks. Macedonians always fought along with the other Greek city-states against enemies from Asia. • Macedonians took part in the Olympic games. It is well known then ONLY Greeks were allowed to take part in the ancient Olympic games. For a list of Macedonians who participated in the Olympic Games click here. • Macedonians celebrated the same festivals as the rest of the Greeks. Examples of festivals which were celebrated in Macedonia as well as in other Greek states are the "Hetaireidia", the "Apellaia" and many more. • Macedonians worshiped the same Gods as the rest of the Greeks. Several temples dedicated to the Greek Gods have beem discovered in Macedonia and especially in Dion the religious center of ancient Macedonians. It is obvious that the Macedonias worshiped the 12 Olympian Gods as the rest of the Greeks. The Gods were "living" on Mount Olympos which happens to be located in Macedonia. How would that be possible if there was hostility between Macedonians and Greeks? This is another proof that Macedonia was considered a part of Greece. • Are FYROM's residents Macedonians? "The beginnings of the statehood of the Macedonian Slaves go back to the end of the 10th century and beginning of the 11t, with the creation of Samoil's state." "We are Slavs who came to this area in the sixth century ... we are not descendants of the ancient Macedonians." "We are Macedonians but we are Slav Macedonians. That's who we are! We have no connection to Alexander the Greek and his Macedonia. The ancient Macedonians no longer exist, they had disappeared from history long time ago. Our ancestors came here in the 5th and 6th century (A.D)." Why do you call yourselves "Macedonians" and your language "Macedonian"? Why do you use ancient Macedonian symbols if they don't belong to you? The historic truth is that the Slavs descented into the region not before the 6th century long after ancient Macedonia was homogenized with the rest of Greece. They don't have any historical cultural or linguistic ties with ancient Macedonia and they would be realy foolish if they officialy claimed that they did. There is no historic or archaeological evidence connecting them with ancient Macedonia. In any case occupying 25% of ancient Macedonian land does not give them the right to steal the Macedonian history and culture. The Macedonian civilization was part of the ancient Greek civilization. This is well known and recorded in history books. It is part of Greece's national inheritance and it can not be used by anyone else. • Why FYROM should not be named "Macedonia"
FYROM's residents have no historical cultural or linguistic ties with ancient Macedonia. The heart of ancient Macedonia was not in the teritory which FYROM occupies but in the Greek part of Macedonia were all the major archaeological discoveries took place. The name "Republic of Macedonia implies a teritorial threat against Greece and other countries and it creates a great risk of renewed ethnic conflict in the Balkans. The area of FYROM was never called "Macedonia" before the 2nd World War. This name was given to the Southern Yugoslavian providence by General Tito aiming to create conflicts in the region and to obtain Greek and Bulgarian teritories. Before the 2nd World War FYROM was called Vardarska. Click here to see a map of Yugoslavia from 1937 Click here to see a Yugoslavian stamp from 1939. FYROM's population is a mixture of many different ethnic groups. Only 60% of them are "Macedonians". There is also a large minority of Albanians (30%) and smaller groups of Serbs Turks, Greeks and others. Ancient Macedonia and its civilization was part of the ancient Greek civilization. • What do the scholars say? From "A History of Macedonia"
"That the Macedonians and their kings did in fact speak a dialect of Greek and bore Greek names may be regarded nowadays as certain." "Ancient allegations that the Macedonians were non-Greek all had their origin in Athens at the time of the struggle with Philip II." "... for with Alexander the stage of Greek influence spread across the world. " • What do the ancient historians say? » What did the Macedonians think of themselves? » What did the rest of the Greeks think? The Greek origin of the Macedonians is proven by the vast majority of the ancient historians. "On his father's side Alexander was a descendant of Heracles and on his mother's he could claim the blood of the Aeacids, so that from his ancestors on both sides he inherited the physical and moral qualities of greatness." "Now that these descendants of Perdiccas are Greeks, as they themselves say, I myself chance to know and will prove it in the later part of my history.That they are so has been already adjudged by those who manage the Pan-Hellenic contest at Olympia. " "This Alexander was seventh in descent from Perdiccas, who got for himself the tyranny of Macedonia in the way that I will show. Three brothers of the lineage of Temenus came as banished men from Argos to Illyria, Gauanes and Aeropus and Perdiccas; and from Illyria they crossed over into the highlands of Macedonia till they came to the town Lebaea." "For in the days of king Deucalion it inhabited the land of Phthia, then the country called Histiaean, under Ossa and Olympus, in the time of Dorus son of Hellen; driven from this Histiaean country by the Cadmeans, it settled about Pindus in the territory called Macedonian; from there again it migrated to Dryopia, and at last came from Dryopia into the Peloponnese, where it took the name of Dorian." "The country on the sea coast, now called Macedonia, was first acquired by Alexander, the father of Perdiccas, and his ancestors, originally Temenids from Argos." "Of the rivers in the Greek world, the Achelous flows from Pindus, the Inachus from the same mountain; the Strymon, the Nestus, and the Hebrus all three from Scombrus; many rivers, too, flow from Rhodope." "Argos is the land of your fathers, and is entitled to as much consideration at your hands as are your own ancestors;"
"After this Alexander left Dareius's mother, his daughters, and his son in Susa, providing them with persons to teach them the Greek language, and marching on with his army on the fourth day reached the Tigris River. " The Macedonians had the same religion as the rest of the Greeks, they worshiped the twelve Olympian Gods. Two quotes from Plutarch's "Alexander"
"Philip, after this vision, sent Chaeron of Megalopolis to consult the oracle of Apollo at Delphi, by which he was commanded to perform sacrifice, and henceforth pay particular honour, above all other gods, to Zeus;"
"He [Alexander he Great] erected altars, also, to the gods, which the kings of the Praesians even in our time do honour to when they pass the river, and offer sacrifice upon them after the Greek manner." "Along with lavish display of every sort, Philip included in the procession statues of the twelve Gods brought with great artistry and adorned with a dazzling show of wealth to strike awe to the beholder, and along with these was conducted a thirteenth statue, suitable for a god, that of Philip himself, so that the king exhibited himself enthroned among the twelve Gods." "He (King Philip) wanted as many Greeks as possible to take part in the festivities in honour of the gods, and so planned brilliant musical contests and lavish banquets for his friends and guests. Out of all Greece he summoned his personal guest-friends and ordered the members of his court to bring along as many as they could of their acquaintances from abroad." "Alexandros observed that his soldiers were exhausted with their constant campaigns. ... The hooves of the horses had been worn thin by steady marching. The arms and armour were wearing out, and the Hellenic clothing was quite gone. They had to clothe themselves in materials of the barbarians,..."
The great philosopher Aristotelis (Aristotle) considers the rivers in Macedonias as "rivers in the Greek world"
"Of the rivers in the Greek world, the Achelous flows from Pindus, the Inachus from the same mountain; the Strymon, the Nestus, and the Hebrus all three from Scombrus; many rivers, too, flow from Rhodope. ..."
"The deluge in the time of Deucalion, for instance, took place chiefly in the Greek world and in it especially about ancient Hellas, the country about Dodona and the Achelous, a river which has often changed its course. Here the Selli dwelt and those who were formerly called Graeci and now Hellenes..."
What did the Macedonians think of themselves? It is very clear from the surviving ancient sources that the Macedonians considered themselves to be Greeks. "... I myself am by ancient descent a Greek, and I would not willingly see Hellas change her freedom for slavery ..."
"Your ancestors invaded Macedonia and the rest of Greece and did us great harm, though we had done them no prior injury [...] I have been appointed hegemon of the Greeks [...] "
"He [Alexander the Great] sent to Athens three hundred Persian panoplies to be set up to Athena in the acropolis; he ordered this inscription to be attached: Alexander son of Philip and the Hellenes, except the Lacedaemonians, set up these spoils from the barbarians dwelling in Asia"
"Every seat in the theater was taken when Philip appeared wearing a white cloak and by his express orders his bodyguard held away from him and followed only at a distance, since he wanted to show publicly that he was protected by the goodwill of all the Hellenes, and had no need of a guard of spearmen." "And when the book of Daniel was showed to him (Alexander the Great) wherein Daniel declared that one of the Greeks should destroy the empire of the Persians, he supposed that himself was the person intended"
What did the rest of the Greeks think? "Therefore, since the others are so lacking in spirit, I think it is opportune for you to head the war against the King; and, while it is only natural for the other descendants of Heracles, and for men who are under the bonds of their polities and laws, to cleave fondly to that state in which they happen to dwell, it is your privilege, as one who has been blessed with untrammeled freedom, to consider all Greece your fatherland, as did the founder of your race, and to be as ready to brave perils for her sake as for the things about which you are personally most concerned." Even the Persians considerd Macedonia a part of Greece! The Persian king Mardonius says : (From the Histories of Herodotus Book 7, Paragraph 9.1-2). "We know the manner of their battle- we know how weak their power is; already have we subdued their children who dwell in our country, the Ionians, Aeolians, and Dorians. I myself have had experience of these men when I marched against them by the orders of thy father; and though I went as far as Macedonia, and came but a little short of reaching Athens itself, yet not a soul ventured to come out against me to battle. [...] Yet the Greeks are accustomed to wage wars, as I learn, and they do it most senselessly in their wrongheadedness and folly [...]. Since they speak the same language, they should end their disputes by means of heralds or messengers, or by any way rather than fighting; if they must make war upon each other, they should each discover where they are in the strongest position and make the attempt there. The Greek custom, then, is not good; and when I marched as far as the land of Macedonia, it had not come into their minds to fight." Mardonius marched against the Greeks and he "went as far as Macedonia, and came but a little short of reaching Athens itself". Obviously he considers Macedonia a part of Greece! In this section we will attempt to answer a series of arguments used frequently to question the Greek identity of Macedonia. "Greece officially denied the use of the name Macedonia after the Balkan wars." Greece has been actively using the name Macedonia since its liberation from the Ottoman empire. If Greece's official position was to "deny the existence of Macedonia" how would it be possible for hundreds of private companies to be named after Macedonia? "Greece has changed the "Macedonian" names of locations in the Macedonia region." The Greek names are older than the Slavic ones and most of them have their roots in ancient Greece. The Greek names of the towns in Macedonia are also mentioned in the Bible. A characteristic example is Thessaloniki. This city was founded in 315 bc by the Macedonian king Kasssandros and it was named after Alexanders' half sister - Thessaloniki. How could the Greeks change the name from Solun (as the Slavs claim) to Thessaloniki in 1912 if that was the original name? The name Thessaloniki is even mentioned in the bible by St Paul. Why did he address his letters (epistoles) to the people of Thessaloniki and not the to the people of Solun? What about the Greek names of towns inside FYROM used during the Ottoman times? Did Greece change them as well? "Today's 'Greeks' and ancient 'Hellenes have no relation between them." How is it possible for the people who live in the same region, speak the same language and have the same names and culture not to be descendants of the ancient inhabitants of the region? Similarly we could say that today's Egyptians are not descendants of ancient Egyptians and today's Chinese people are not descedants of ancient Chinese. "There is a large Macedonian minority in Greece"
There is no "Macedonian minority" in Greece because there is no such nationality. There is a small group of people who speak a Slavic dialect which is in fact different from what is claimed to be the "Macedonian language" These people are not a "Macedonian minority" as they consider themselves Greeks. There is also an even smaller group of Slav propagandists who are trying to create a Macedonian minority in Greece. Anyone who didn't consider him/herself Greek could and should have left Greece during the exchange of populations in 1919. "One million people in Greece consider themselves Macedonians"
In the 1996 parliament elections in Greece the political party of the people who claim to be a "Macedonian minority" gained 3.485 votes (official result). In the 2000 parliament elections they didn't take up part at all. Of course there is no doubt of the integrity of the election procedures since Greece is a member of the European Union. If there was such a large number of "Macedonians" in Greece (1/10th) wouldn't be easy for them to stand up against the "Greek occupation"? "Greece acquired illegally Aegean Macedonia in 1913"
Greece acquired 51% of Macedonia in 1913 as a result of the treaty of Bucharest. International treaties are not illegal. Furthermore Greece in 1913 was not a powerful country to acquire any land it desired. This land was "given" to Greece because it historically belonged to Greece and its residents were Greek. "What gives Greece the right to name another country? This issue is straightforward, every country has the right to call itself whatever it wishes." This is a misleading statement. The author knows very well why Greece is objecting to the use of the name Macedonia. In fact every country has the right to chose its own name as far as it does not belong to another country's history. The name Macedonia belongs to the Greek history. Greece has the right to protect its history and heritage. "Saints Cyril and Methdje (or Kirl and Metodi) were not Greeks but Macedonians." Saints Cyrilos and Methodios were Greeks born in Thessaloniki and this is well known to all Christians. Pope John Paul the B' in an official apostolic homily to the entire Catholic Church proclaimed that Methodius and Cyril "Greek brethren born in Thessaloniki" are consecrated as "heavenly protectors of Europe". John Paul B' repeated this statement in a speech delivered in the church of Saint Clements, in Rome. You can see the original document here. "Greece stole the Macedonian history"
"Linguistic science has at its disposal a very limited quantity of Macedonian words. A very limited quantity in this case is a quantity indeed, that Greeks cannot ignore." This argument proves the Greek point that the "Macedonian language" was a Greek a dialect. There only exists "a limited quantity of Macedonian words" because the Macedonian dialect had "limited" differences from the Greek language. How could it be possible for a separate "ancient Macedonian language" to disappeared after what Alexander had achieved? "If Philip united and not conquered the Greeks why did Alexander leave 25.000 men of his army in Macedonia when he is about to face the strongest and most numerous army in the world?" No sensible leader would go on a quest taking ALL his army with him and leaving his homeland unprotected! And of course he did not leave 25.000 men in Macedonia because he was afraid of the other Greeks. Macedonia had lots of real enemies at its northern border (Illyrians, Dardanians,Paionians etc). "If Macedonians were Greek then why only 30% of Alexander's army were Greek?" The right question to ask is 'why as many as 30% of Alexander's army were from the rest of Greece?' After all Macedonians and Greeks were supposed to be enemies! The Macedonians 'conquered' the Greeks according to the Slavic version of the Macedonian history. The fact that a very significant part of Alexander's army were non-Macedonian Greeks shows the truth. "Ancient Macedonians did not take part in the Olympic Games"
This is another false statement. It can be easily proved that people from Macedonia took part in the Olympic Games. For a list Macedonians who won the Olympic Games the click here. "Ancient Macedonians fought against Greece." This is another misleading statement. It is well known that the ancient Greek states were largely independed of each other and that often led to wars between them. Some well-known examples are the Peolloponisian was between Athens and Sparti, the Athenians quest in the island of Mitilini, the brutal war between Sparti and Thebes and many more. A war between two ancient Greek regions did not mean that one of them was not Greek. "There are no ancient monuments written in the Macedonian language because Greek archaeologists destroy them when they are recovered." Even if we accept that this is true it still doesn't explain why aren't there any monuments in the rest of Macedonia! What about the ancient monuments in FYROM and Bulgaria? What about the ancient monuments on Alexander's route in Asia? Why aren't there any "non Greek Macedonian monuments" ? Oh, I know why! The Greek archaeologists must have destroyed them as well !!! "If in fact, "Macedonia is Greece", how come they feel the need to emphasize, to shout, and to proclaim over and over again? After all, we never hear them proclaiming that 'Thebes is Greece', or 'Sparta is Greece' ". "MACEDONIA WILL BE FOREVER GREEK"
This is a list of books we recomend for further information about Macedonia and its history. The books listed below are written and published by non Greek authors and publishers so that they may not be characterised as biased. "In the Footsteps of Alexander the Great : A Journey from Greece to Asia"
"A History of Macedonia (Hellenistic Culture and Society)"
"Alexander the Great and the Hellenistic Empire"
"Griechische Geschichte : von den Anfanfen bis in die romische Kaiserzeit." Ξέρετε που εστίαζε τους αγώνες του το ΚΚΕ για δεκαετίες ολόκληρες; Στην ΑΥΤΟΝΟΜΗΣΗ της Μακεδονίας και της Θράκης! Παρόλο που στην Μακεδονία κατοικούσαν χιλιάδες Σλαβόφωνοι Έλληνες, Έλληνες Βλάχοι κι Αρβανίτες, Ελληνόφωνοι Έλληνες και τέλος πάνω από ΜΙΣΟ ΕΚΑΤΟΜΜΥΡΙΟ ΠΡΟΣΦΥΓΕΣ! Αφασία του ΣΥΡΙΖΑ για το Σκοπιανό! Είπε ο Αλαβάνος στη Βουλή: "Η Μακεδονία=Τίτλος για Φέρετρο"! Πριν από τις εκλογές Ο ΣΥΡΙΖΑ ΑΝΑΓΝΩΡΙΖΕΙ ΤΑ ΣΚΟΠΙΑ ΩΣ ΜΑΚΕΔΟΝΙΑ! Για τους 100.000 Ελληνόφωνους Βλάχους που απαριθμεί η ΞΕΧΑΣΜΕΝΗ ΕΛΛΗΝΙΚΗ ΜΕΙΟΝΟΤΗΤΑ ΣΤΑ ΣΚΟΠΙΑ. Με τις κλωτσιές τους διώχνουν από το Ελληνικό Προξενείο της FYROM! Ενώ οι Σκοπιανοί ΑΠΑΓΟΡΕΥΟΥΝ ΕΛΛΗΝΙΚΟΥΣ ΣΥΛΛΟΓΟΥΣ και ΓΚΡΕΜΙΖΟΥΝ τις Ελληνορθόδοξες Εκκλησίες. Δημόσιος Υπάλληλος ο Παύλος Βοσκόπουλος ,Γεν.Γραμματέας του Ουρανίου Τόξου, και καταγγέλει το Ελληνικό Κράτος-Εργοδότη του για ΠΑΡΑΒΙΑΣΗ ΑΝΘΡΩΠΙΝΩΝ ΔΙΚΑΙΩΜΑΤΩΝ !!! Διαβάστε σχετικά εδώ! αποσιωπήθηκαν από ΟΛΑ τα ΕΛΛΑΔΙΚΑ ΜΜΕ! ΓΙΑΤΙ;;; Για να ΜΗΝ βάλουν ιδέες και στους Έλληνες και πάρουνε τους δρόμους! οι ΣΚΟΠΙΑΝΕΣ ΠΡΟΚΛΗΣΕΙΣ συνεχίζονται μέχρι και τις μέρες μας για όσους ΔΕΝ ΠΙΣΤΕΥΟΥΝ ΤΙ ΚΡΥΒΕΤΑΙ ΠΙΣΩ ΑΠΟ ΤΗΝ ΕΜΜΟΝΗ ΣΤΟ ΟΝΟΜΑ! Ανάλογα με τις εξελίξεις ... οι Σκοπιανοί μας έχουν ετοιμάσει σχετικό πακέτο εκδίκησης! ΑΠΟΛΑΥΣΤΕ ΤΟ! Οι Σλαβόφωνοι Έλληνες πολέμησαν και το 1821 αλλά και στον Μακεδονικό Αγώνα κατά χιλιάδες. Σχετικές λίστες υπάρχουν εδώ ! Γαλλική ΑΠΟΓΡΑΦΗ των σχολείων της Μακεδονίας επί Τουρκοκρατίας δείχνει μία πραγματική εικόνα της εποχής και θα την βρείτε εδώ!. Οι "Μακεδόνες Σκέτο" πάλι μας κρύφτηκαν! Σας προτείνω να δείτε το ντοκιμαντέρ ZEITGEIST Επίσης μπορείτε να κατεβάσετε το ντοκιμαντέρ ZEITGEIST εδώ! this website whoever wrote it must have done some serious work to do and finish this thing because well all i have to say is its fantastic and its really helping me on my project i have to do for my advanced geography class so i just want to say thanks for being a super smart nerd!